How do I update my dongle to enable analysis in a new version of the software? 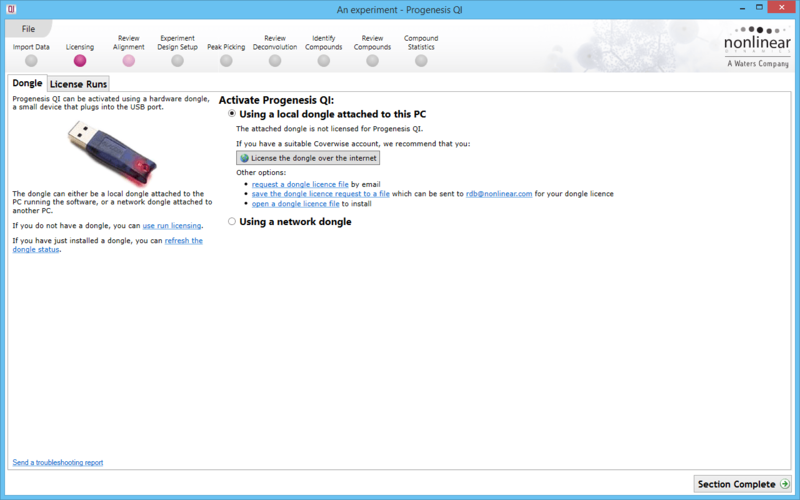 The analysis capabilities in Progenesis QI are enabled by use of either a hardware dongle or by entering sample licence codes when prompted by the software. Hardware dongles are typically provided when the software has been purchased, allowing analysis of all of your data in the purchased version of the software. When you install a new version of the software, however, you may need to update your dongle to allow analysis in that version. Note: to update your dongle, it must be inserted into one of the USB connections on the PC on which the software is running. This is the recommended approach. To update your dongle via the internet, simply click the button named License the dongle over the internet. Assuming your PC has an internet	connection and your support account entitles you to the upgrade, this method should take just a few seconds to complete. If clicking the “request a dongle licence file” link doesn't work, then you can click the Save the dongle licence request to a file link instead. Attach the saved file to an email and send it to rdb@nonlinear.com and continue the process from step 3 above. After the update, the options will change to show that the dongle has been licensed (show me). You can then continue to the next step in the analysis workflow by clicking the Continue using the product link. If you have any difficulty with either of these methods, please contact our support team. How do sample licence codes work?